Banks have been given a few booster shots in the last couple of months. In anticipation, the sector's stocks have been doing better than the overall market for the last few months. 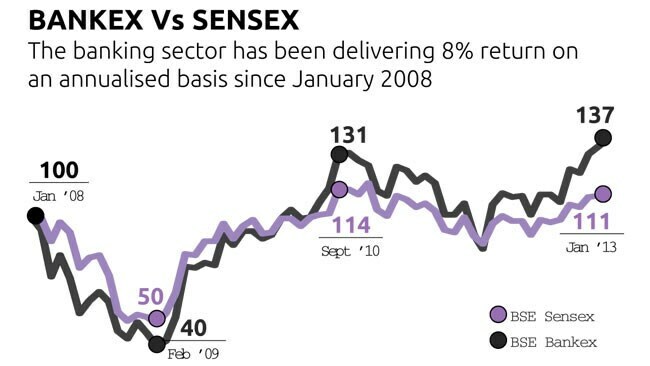 The backbone of India's financial sector is getting its strength back. Banks, battling low credit demand and rising bad loans, have been given a few booster shots in the last couple of months. One, Parliament cleared a Bill that will lead to the setting up of new banks. Two, on January 29, the Reserve Bank of India, or RBI, lowered the rate at which it lends to banks by 25 basis points or bps. To top it all, the government's efforts over the last few months to boost growth are likely to increase the demand for credit and improve banks' asset quality. In anticipation, the sector's stocks have been doing better than the overall market for the last few months. The RBI is expected to expedite the process of issuing bank licences after the banking Bill becomes a law, says Vaibhav Agrawal, VP, research banking, Angel Broking. Another trigger for the stock rally is a proposal in the Bill to increase voting rights from 1 per cent to 10 per cent in case of public sector banks and 10 per cent to 26 per cent in case of private banks. This has improved investor sentiment, says Saday Sinha, banking analyst, Kotak Securities. "This will benefit private sector banks such as Kotak Mahindra Bank, Yes Bank and ING Vysya Bank where promoter holding is more than 10 per cent," says Vinay Khattar, head of research (individual clients), Edelweiss Financial Services Ltd. Experts say the entry of new banks is likely to attract foreign funds into the sector. "Apart from bringing tougher competition, new banks will increase the acquisition prospects of older private banks," says Agrawal. This is, in fact, the main reason for the recent rise in shares of these banks. "In this space, South Indian Bank looks attractive, as it is trading at a reasonable valuation compared to other older private sector banks and has decent fundamentals," he says. "Stocks of other older banks that one can consider for gaining from a possible acquisition are Federal Bank and Karur Vysya Bank," says Agrawal. However, Rajat Rajgarhia, director, research, Motilal Oswal Financial Services, feels that this may be a time-consuming process and take another 12-15 months. Edelweiss' Khattar says the worst is behind us on the macroeconomic front, and with the RBI cutting interest rates, economic growth will in all likelihood pick up. 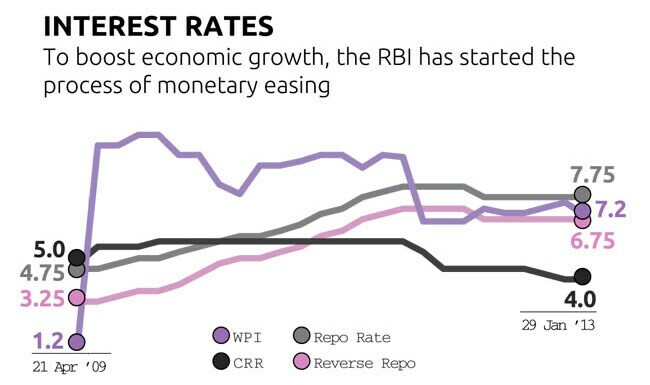 After keeping the repo rate unchanged since April 2012, the RBI, in its thirdquarter review of the monetary policy, slashed it by 25 bps to 7.75 per cent. It also cut the cash reserve ratio, the proportion of funds banks have to keep with it, by 25 bps to 4 per cent. Agrawal says the RBI is shifting focus from controlling inflation to supporting growth. Also, in the near term, lower commodity prices are expected to bring down inflation, opening the window for a further cut in the repo rate. Agrawal expects the RBI to lower the repo rate by another 25 bps by the fourth quarter of 2012-13. Lower interest rates are positive for banks as they aid credit growth and improve asset quality. "Over the next financial year we could see rate cuts up to 150 bps," says Khattar. Angel's Agrawal prefers private sector banks given their strong capital base, growth prospects and asset quality. Private sector banks are expected to post a strong 22.5 per cent growth in net interest income while public sector banks are expected to lag with 4.5 per cent growth. Banks in general are expected to improve margins due to better credit offtake and reduction in term deposit rates. Their cost of funds is also likely to come down, considering that short-term borrowing rates have already started falling. Experts say valuations of public sector banks offered a lot of bottomfishing opportunities three-four months ago. "After the recent surge in several of these stocks, further upsides would have to be driven by catalysts such as lower pricing of high-cost deposits and higher recoveries," says Agrawal. Another important factor is Tier-I capital, considering the nearterm capital-raising plans of many of these banks. So, government banks with adequate Tier-I capital can be a good investment option. In 2011-12, the asset quality of banks was severely impaired, as seen by the steep increase in nonperforming assets, particularly for PSU banks owing to their significant exposure to troubled sectors such as power, aviation, real estate and telecom. According to Dun & Bradstreet, in 2011-12, net bank NPAs grew 55.6 per cent while there was a 58 per cent rise in restructured assets. Another reason analysts prefer private sector banks is that they have better asset quality because of their lower exposure to small and medium enterprises. Plus, retail business is a big part of their portfolios. "For instance, ICICI Bank's 35 per cent book is retail, which is witnessing good asset quality, while exposure to SMEs is less than 5 per cent," says Sinha of Kotak. Agrawal prefers Axis Bank, ICICI Bank and Yes Bank due to capital adequacy and branch expansion plans to gain a higher share of the loan market and increase their low-cost deposits. The loan growth for public sector banks for 2012-13 and 2013-14 is expected to be 14-16 per cent and for large private sector banks in the range of 18-24 per cent. 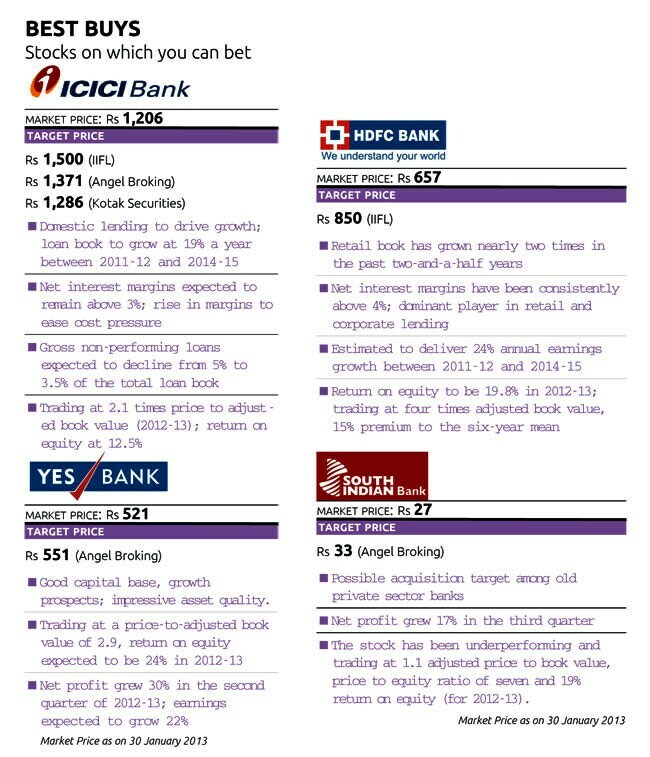 At the same time, private sector banks have decent asset quality and are trading at reasonable valuations. This is despite the fact that any reduction in interest rates will increase the value of public sector banks' huge bond holdings. Bond prices rise when interest rates fall. Sinha of Kotak Securities is cautious on government banks due to poor asset quality and large restructured assets which will require provisioning. Among government banks, Sinha recommends Bank of Baroda and SBI, but only on correction. Although SBI's asset quality has stabilised, net interest margins have fallen from 4 per cent to 3.5 per cent. "So, even though loan growth has picked up, margins are down, which will impact the net interest income," he says. Experts say interest rates may not fall as expected. Notably, the RBI expects headline inflation to remain around the current levels in 2013 due to the recent increase in diesel prices and rising input costs for industry. However, the government's projections suggest that headline inflation may decline by around 1 per cent in the period. Further, despite a 175 bps cut in the CRR and a 75 bps cut in the repo rate in the last 12 months, banks have cut lending rates by only 25-40 bps.